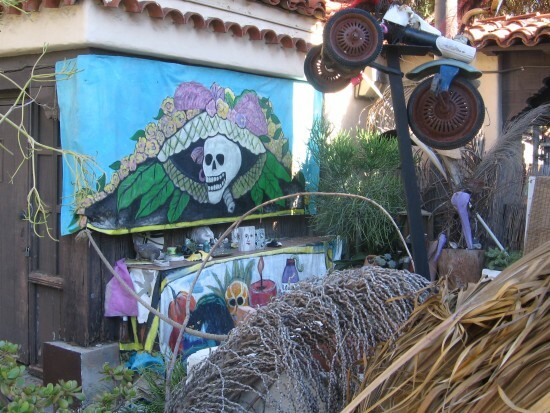 fun – Page 53 – Cool San Diego Sights! 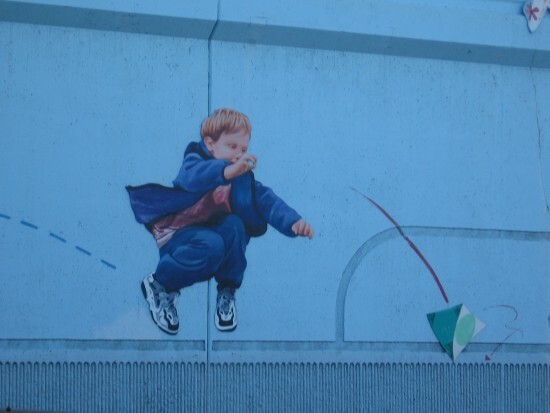 Mission Valley mural of kids at play. 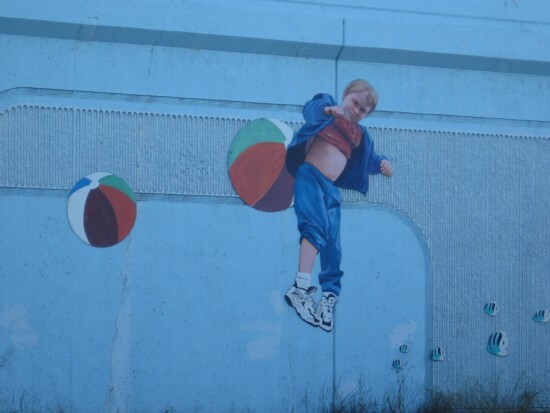 This is a part of a very long mural decorating the north side of Interstate 8 in Mission Valley. It’s called Kids being Kids. I took this photograph from across Camino de la Reina, not far from the Union Tribune building. I got a bunch of pics, but this is the only one that captures the artwork’s color and energy. Perhaps I’ll try again some other day. Beach balls bounce beside a busy San Diego freeway. 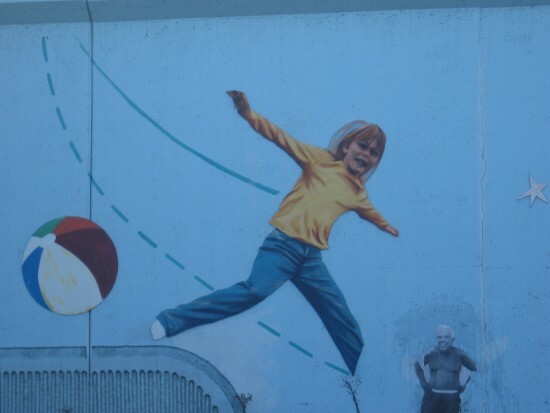 Flying with arms wide across a lively public mural. 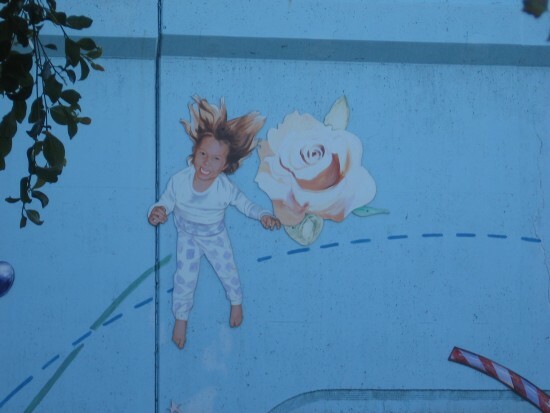 Girl jumps on beloved mural beside Interstate 8. It seems that kids will simply be kids. 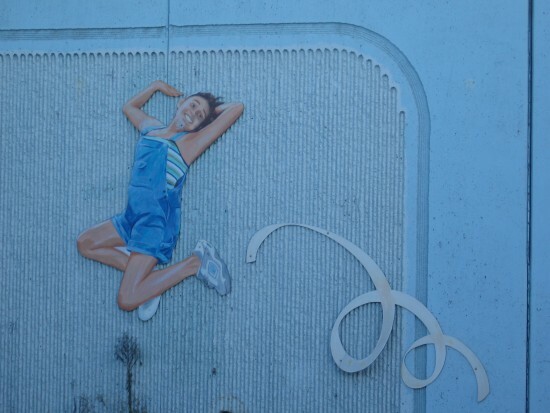 Little girl is a delightful image in public art. 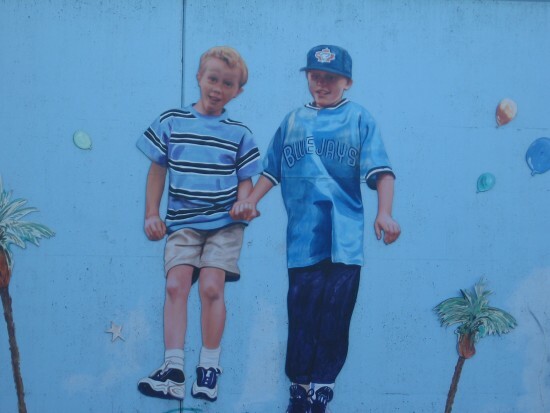 Two young friends are one element in a fun mural. Posted on September 8, 2013 March 27, 2015 Tags art, culture, fun, kids, mission valley, murals, painting, public art, san diego, urban art2 Comments on Mission Valley mural of kids at play. Stairs up and down: Horton Plaza, Lyceum Theater. Stairs head up into Horton Plaza. Lyceum entrance is below. Just a few quick pics. 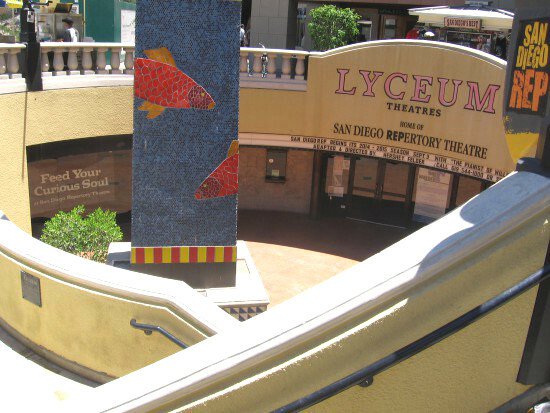 In the above one you can get a glimpse of the underground entrance to the Lyceum Theater, home of the San Diego Repertory Theatre. 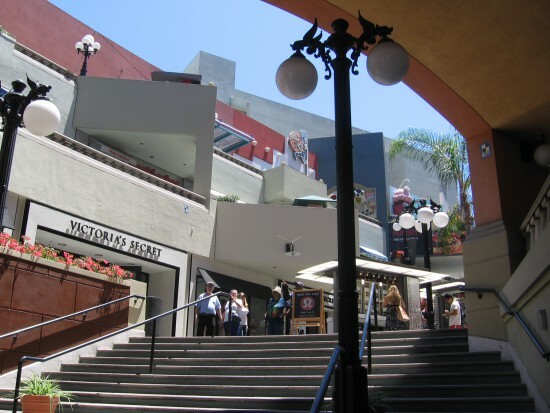 In the photograph’s center are the main stairs that sweep upward into the Horton Plaza shopping center. The red building to the left has walkways on each level that provide fantastic views of the mall’s colorful, surprising interior. During my walks I’ve taken many pics inside Horton Plaza. I’ll blog about that one day! Near the colorful main entrance of Horton Plaza. 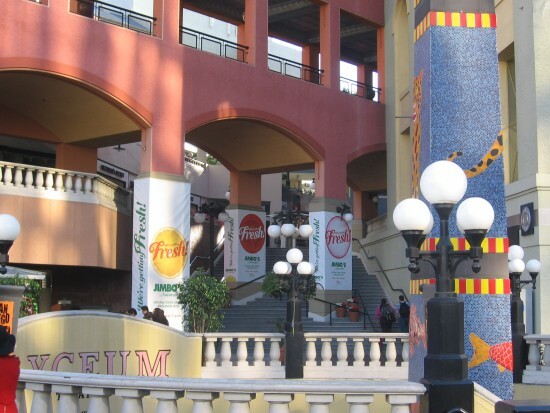 Broad stairs ascend into San Diego’s unique Horton Plaza shopping mall. Gazing down into the unique underground entrance of the Lyceum Theater. Musician heads down stairs for a rehearsal. 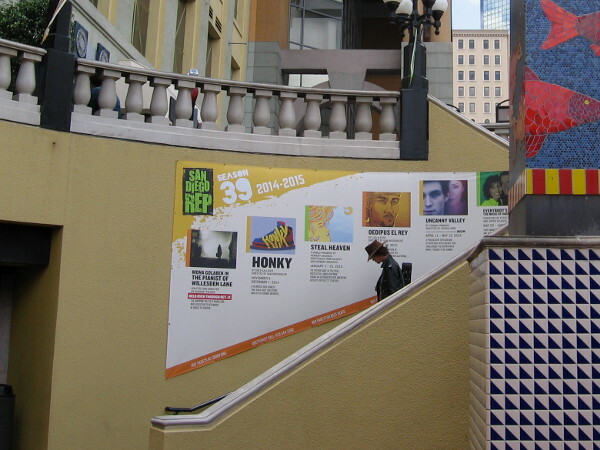 Posted on September 7, 2013 May 26, 2015 Tags architecture, buildings, cool, downtown, fun, horton plaza, lyceum theater, photography, san diego, theatreLeave a comment on Stairs up and down: Horton Plaza, Lyceum Theater. Colorful animal obelisk in front of Horton Plaza! Here’s a much better look at the obelisk in question. (See my last blog post.) 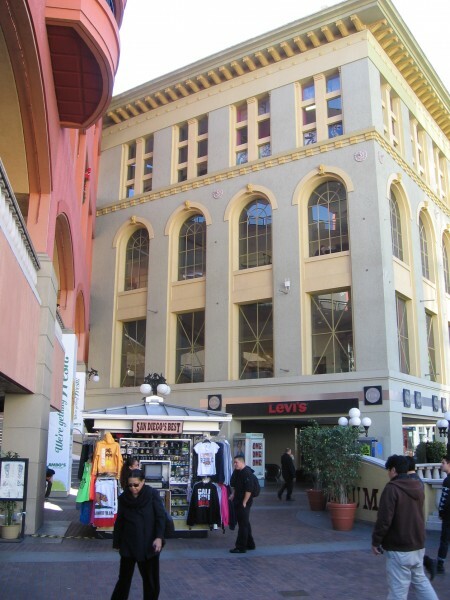 It thrusts out of the ground right in front of Horton Plaza, marking the underground entrance to the Lyceum Theater. Animals of the water, land and air, fashioned out of colorful tiles, frolic together in a mosaic beneath a smiling crescent moon! This playful work of art and the beautiful architecture of the building behind it is just a small hint of the fun that awaits visitors inside the Horton Plaza shopping mall! Looking down at the obelisk and underground entrance to Lyceum Theater. 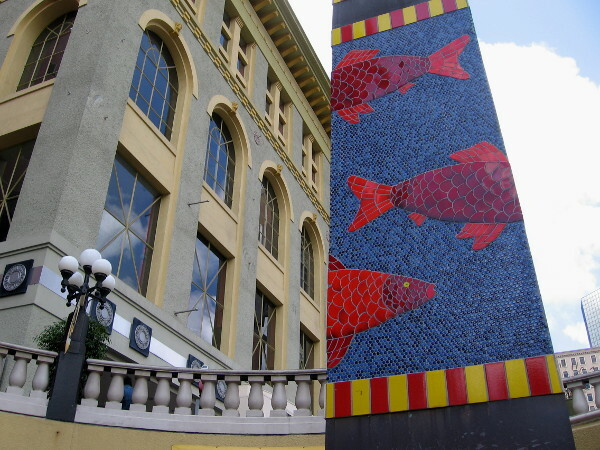 A closer view of artistic fish on the Horton Plaza obelisk. 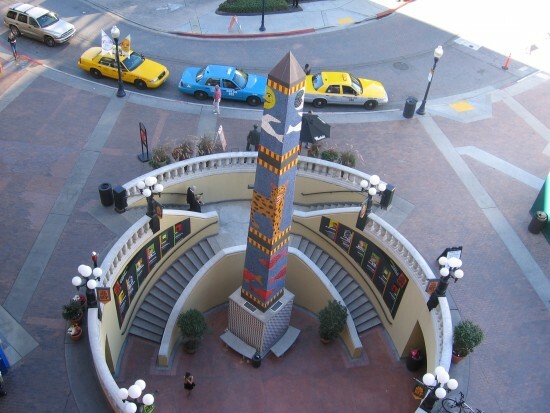 Posted on September 7, 2013 May 25, 2015 Tags animals, architecture, art, buildings, color, downtown, fun, horton plaza, mosaic, photography, public art, san diegoLeave a comment on Colorful animal obelisk in front of Horton Plaza! Funky, folksy Studio 13 in Spanish Village. 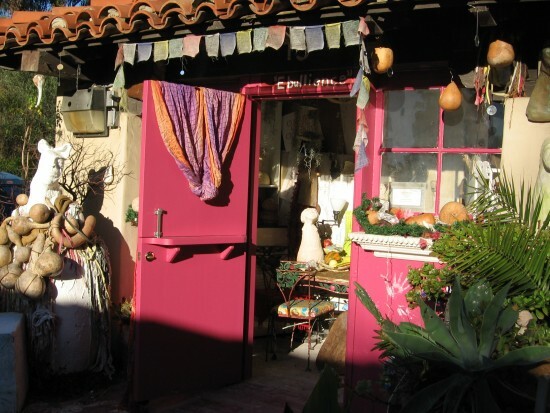 Take a look at the deliciously, crazily, wonderfully picturesque Studio 13 in Balboa Park’s always surprising and colorful Spanish Village! 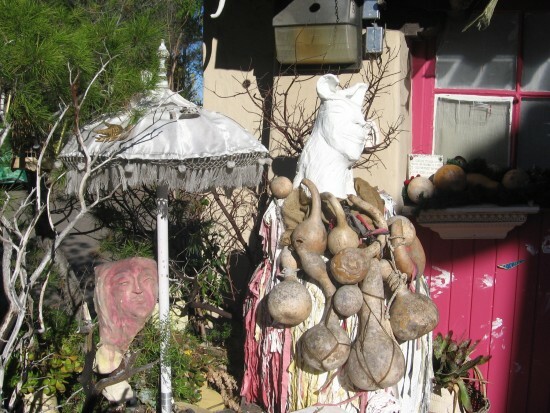 This quaint little studio is both funky and folksy, a wild mixture of creative artistry! A peek inside Studio 13 in Spanish Village. Looking around the side of Studio 13. Looking behind funky Studio 13 in Spanish Village. Posted on September 1, 2013 December 29, 2013 Tags art, artists, balboa park, creativity, fantasy, fun, funky, happy, san diego, spanish villageLeave a comment on Funky, folksy Studio 13 in Spanish Village.